Welp guys, the unthinkable happened. For two years, now, the Toronto media has guaranteed that Babcock would coach the Maple Leafs when his contract with Detroit was over. Aaaaaaaaand here we all are…. WOAH. 50 million over 8 years. Around 8 million a season. That blows the next highest paid coach out of the water by SIX (6) million dollars. I don’t understand! This is an initial reaction post and I’ll post my full thoughts later. But OH MAN. See ya, Mike. Good Luck! Edit: The 8 million a season is for the first half of his contract. It’ll be reduced after that. Hai guys! You watch the game last night? That was fun, right? The funny thing, and it’s definitely attributed to how this season has gone, is how Wings fans reacted to winning our 2nd straight home game for only the second or third time this year. Who are we, the Islanders? Hell, they’ve done that more often this season than the Wings have. But that’s really not the point. The Wings have put together some solid efforts in three of their last four home games. The lone calamity came against St. Louis in an effort that many players agreed to just “flush”. We’ll talk about that a bit before I have to leave again (busy life), and talk about the Wings’ waiver transaction today that I’m sure most will be happy with. The Wings won in a really good effort against a good but sliding Montreal team. They’ve now lost three in a row and are just three points up on Detroit for third in the division. If the Wings can win against Florida on Sunday and have a good showing against Philadelphia on Tuesday, it’ll go a long way to making up lost ground. Add to that the fact that we should be getting Franzen back for the game against Florida and possibly Andersson back in the next week and hopefully Datsyuk soon, and we could get rolling soon. Weiss is due back for the first game after the Olympic break so the Wings may finally get the roster they wanted to go with all season. Anyway, the game: Zetterberg, Nyquist, Kronwall and Sheahan all tallied goals. Sheahan’s was especially impressive. Everyone in the building voided their bowels upon seeing it. It was disgusting. I’ve been getting more and more impressed with Glendening’s game. He’s not going to score much, that’s a certainty, but he honestly reminds me of a combination of Draper and Maltby, but still without the offensive acumen. He’s got really good speed and has been getting especially efficient at getting under players’ skin without playing dirty. He’s got an edge to his game and he plays a fast, hard hitting game, but nothing dirty. I’m really loving it. He just needs to work on face-offs and he’ll be good to go. Ok, and now the moment you’ve all been waiting for……THE WAIVER TRANSACTION! If you’re reading this you probably already know but LET ME HAVE MY MOMENT. The Wings have placed forward Mikael Samuelsson on waivers this afternoon to make room for Johan Franzen. Samuelsson has been a healthy scratch for basically the whole year after losing his spot to Tomas Tatar around the 10th game. It’s been pretty telling, for some time, that Detroit has been calling up young guys to keep Samuelsson off the ice. The curious thing, now that they need a roster space, is they’ve opted to keep Jurco up for as long as they can and waive Samuelsson, who won’t offer anything in terms of cap relief. Because he signed a 35+ contract and the new CBA is weird about waiving players, his cap relief will only be $100 thousand so it doesn’t do anything to help our eventual cap issue, which we will have when Weiss comes off LTIR at the end of February. At any rate, I’m sure there was a joyful chorus from Wings Nation when the tweets started coming out that Detroit had waived Sammy. It was a long time coming and I hope he does get claimed, which will mean his entire cap hit comes off the books. I doubt that’ll happen, though. Happy Saturday, guys. Enjoy your weekend and as always, GO WINGS! Helm gets the game winning shoot out goal. You didn’t misread that, it happened. Or is it just another “up” in a land of mountains and valleys? 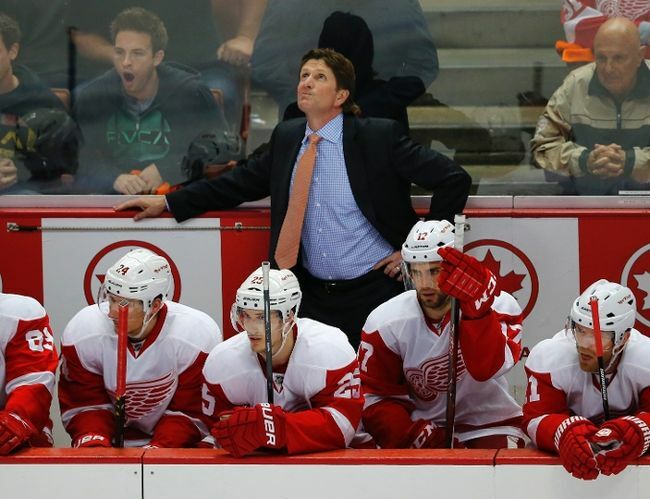 Yesterday, the wings managed to outplay Chicago and overcome deficits twice to win 5-4 in a shootout at JLA. Aside from nearly having a heart attack and passing out several times, the game was tremendously exciting. It was wide open at times, it was grinding at times and it was chippy at times. I laughed, they cried, and every passing car burst into flames. WINNER! I know that the collective of Wings fans probably woke up and rolled their eyes this morning realizing that Chicago comes to town tonight. Almost giving up and saying “here we go again”. Let’s all just be honest here, this game has the potential to be a very ugly game. But, realistically, every game has the potential to be a very ugly game. Anyone remember back in February of 09 when Detroit went to Nashville? Detroit was still a very good team and Nashville was meh, Detroit lost 8-0. I was there. It was awful. Anyway, a very good, very fast and very potent Chicago team comes to Motown and face a Red Wings team still trying to find their way through a maze of injuries and ineptitude.